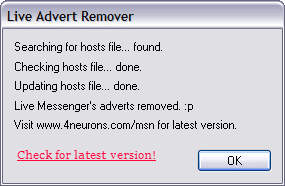 Live Advert Remover (Live Messenger Advert Remover formerly known as MSN Advert Removal) blocks all advertisement banners from being displayed in Windows Live Messenger. It works with all versions of MSN and Windows Live Messenger. You need to run it only once to patch. your system. Live Advert Remover will not make the default Live Messenger banner dissapear. This banner will remain intact, but simply it will never be replaced by any commercial advertisement. Also this program does not remove any advertisement provided with Messenger Plus! extention. If you don't want advertisement that comes with Messenger Plus! simply don't install that extension.